I have - at long last! - joined my first book club! We have one meeting under our belts, and another coming up soon. We discussed the book, went off into related tangents and then came back, interrupted each other, disagreed, echoed, dissected and nodded a lot. We drank wine, ate cheese, and even discussed some of the discussion questions found in the back of someone’s copy. The first book selected was Three Day Road by Joseph Boyden, a Canadian novel that tells two stories at once, one set on the frontlines of World War I at Vimy Ridge, Passchendale and more, and another set in the Canadian bush and nearby towns and the ‘residential schools’ that attempted to assimilate Aboriginals into white culture. It was excellent. Impossible to put down. Upsetting and grim in parts, but engaging, well-written, and intriguing in its contrast between modernity and tradition, superstition and reality, city and country. I loved it. And I usually have difficulty stomaching war books. The second book we read is The Help by Kathryn Stockett. 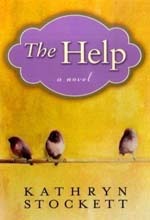 The Help is not only the first novel from Mississippi’s Stockett, but her first book of any kind. And it’s a heck of a debut. I adored this book. Examining the dynamics between African-American domestic help in the 1960s and their families, the story tackles difficult, painful issues with sensitivity, honesty and even humor. I was so impressed by the warmth and authenticity of the characters, and the story’s pace throughout. So now that our book club is underway, what makes a good book club book? We meet once a month, so enormous 900-page tomes are problematic, as are extremely difficult reads. Formulaic or predictable fluff - "airplane reads" if you will – might be entertaining, but are rarely thought-provoking or complex enough to promote good, healthy discussion or argument. And that's exactly what you want, really, isn’t it? A book that makes the reader think. If a book engages the mind, deals with issues that aren’t obviously cut and dried, takes the reader somewhere new, out of their comfort zone and perhaps makes them look at situations from a different perspective then people are going to talk. I've heard countless times that Harper Lee's To Kill a Mockingbird (another book about race relations in the southern United States) is the ultimate book club choice. But can that be true when so many readers encounter this famous book while in school, have watched the movie and become thoroughly familiar with the novel’s folklore? Shouldn’t book clubs take a road less travelled? Variety is also important. If each month’s book is a lesbian love story, or a coming-of-age account, or a Victorian novel, you’re likely to become bored. Trying to mix non-fiction with fiction, books from different geographical settings, authors of different generations, socioeconomic backgrounds and eras is a sure way to keep everyone engaged and talking. Reading a good book is such a pleasure, and it's made even better by sharing it with other people, even if we are interrupting each other, disagreeing, and breaking off into other topics. Is there a better way to spend an evening? When I die, if I’ve been very good, keep the harp - give me good books, good food and good people with whom to enjoy both, and maybe some laughter. Here are 25 books we suggest as good book club choices. Are you a member of a book club? What are you reading? › Size Does Matter. The Longest Novels.